The Coleman is a famous brand which most of the time is known for its wide range of tents. One of its products is the Steel Creek 6 Person Tent that has a spacious room with a focus to accommodate six individuals. It comes with a lounged porch area which is screened off using mesh stuff. This feature is especially designed to help you prevent mosquito bites. Let us begin with our Coleman Steel Creak 6 Person Tent Review and explore more of this product in detail. With a number of useful features, the Coleman Steel Creek 6 Person Tent is an amazing tent to enjoy your camping trip. It has numerous window awnings that ensure great ventilation inside the tent in addition to perform well in the rain. Moreover, this fast-to-pitch camp has a typical design, fast setting feet and pre-attached poles.In 2017 it’s one of the best Coleman Tents so far. Who Should Use This Camp? It’s an ideal tent for those who look for an excellent waterproof awning for their weekend trip during summer; or for a small family who want to enjoy backyard camping. The tent is even a perfect choice for camping outside. It has several wonderful features and spaciousness that make the tent just perfect. The Coleman Steel Creek 6 Person Tent is one of the most excellent camps of its genre. It performs really well and does its job exactly in the way it was designed for. However, the only concern with this canopy is its price which is quite high. Even though, there are a number of good alternatives that come cheaper than this one, it is known for its high quality material, functionality and durability. 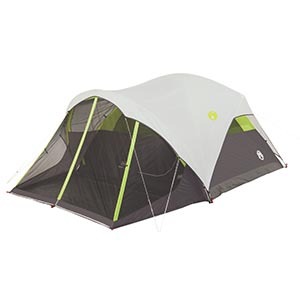 The Coleman Steel Creek 6 Person Tent has reflective guy lines that are meant to help you prevent yourself and your family from tripping over them and getting hurt during hours of darkness. The tent includes a lounged-porch area that comes handy in helping you avoid mosquito bites. It has an easy a 7-minute easy setup though it is a large camp. It’s a very spacious camping with the capacity of two queen size air-beds in addition to other equipment. Furthermore, it has an excellent weatherproof sleeping area that is designed to keep you dry in a rainy season and help you avoid potential problems you get from standing up in strong winds. The Coleman Steel Creek 6 Person Tent is costlier than similar products of Coleman such as the Evanston, though it is the best tent to perform extremely well in downpour. The tent often gets dirt onto its screened room. Also, it can actually get blown in mud during rainy or windy season. Provided that the rain fly doesn’t actually cover the entire room top, there is a likelihood of rain getting into the porch area. Some people have found it quite struggling to fit into its storage bag after breaking down. Though there are several issues with the basic features of the Coleman Steel Creek 6 Person Tent, it still performs well in a rainy season. It amazingly works to keep the campers dry, and doesn’t blow away in high winds. In simple words, the Coleman Steel Creek 6 Person Tent is one of the best tents for hard weather conditions. It is more expensive than many other similar products of the brand but its high quality performance for keeping the main area dry and withstanding strong wind gusts really worth the money.